You will get a comfortable mat free when you add both to the cart. Constructed of high-quality MDF desktop and sturdy steel legs and base, our sit-stand desktop is extremely stable and durable. No assembly required, just use straight out of the box, and enjoy the health benefits of standing during your work. This vertical table is to be placed on the table of use, the height of the vertical table base is suitable for sitting work, you can adjust the height properly until it is suitable for standing work. After a long standing to work, if you want to sit down, holding the handle with both hands,Gently press and adjust to a comfortable location. Unprecedented 50cm maximum lifted height especially great for TALLER PEOPLE. 【Ergonomic Design】 Accurate height design, hydraulic lifting control. Helpful to long time work office staff, pregnant women, Spine and cervical spine uncomfortable group. Height adjustment as your wish sit and stand. 【Operating Space】The width of platform is 35"(89cm) not only can place a large Monitor,but dual smaller monitors setups(Not good for two big monitors).The vertical height of the table is 5.1 inches, you can adjust the max height is 19.7 inches. 【X-Shaped Structure】 Stable vertical adjustment height, no displacement, no gear limit, free adjustment. Can stay at any height you want. Hold the handle at the bottom of the table and adjust the height of the table. 【Easy to Use】No special mounting or tool-adjustments required for installation.Improved computer monitor desks/tables/stands/mounts and support, with full user satisfaction in mind. 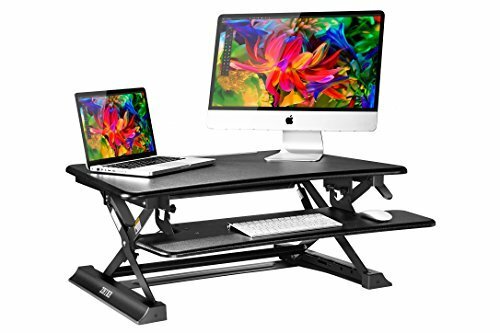 【Multiple Use】In addition to being used as a standing computer desk, it can be used workbench for living room,office,laboratory,garage, warehouse,etc. If you have any questions about this product by ZHIKE, contact us by completing and submitting the form below. If you are looking for a specif part number, please include it with your message.